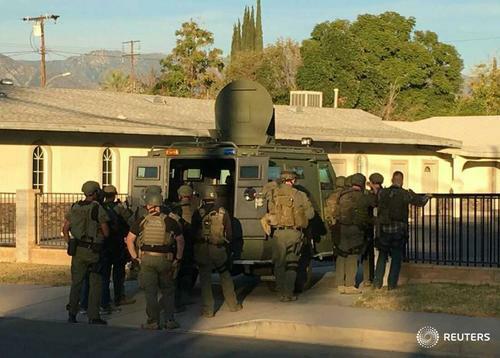 Police followed tips that took them to residence. 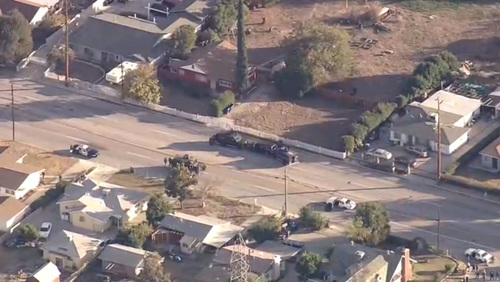 Vehicle seen leaving and officers pursued. 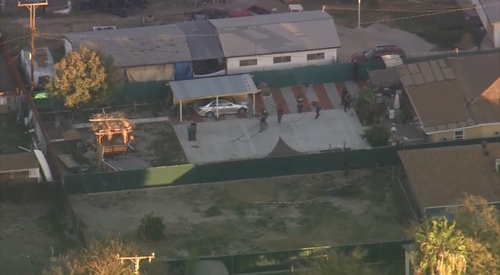 Police found suspicious devices, one believed to be explosive, at scene of shooting, police say. 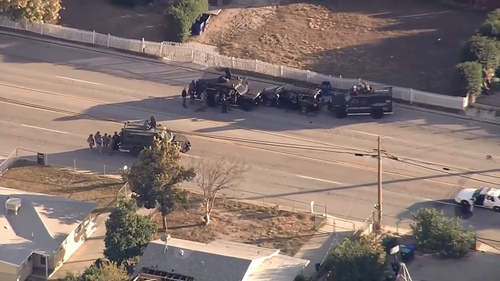 It's now dark in San Bernardino. This press conference is about to begin -- should be any minute now. 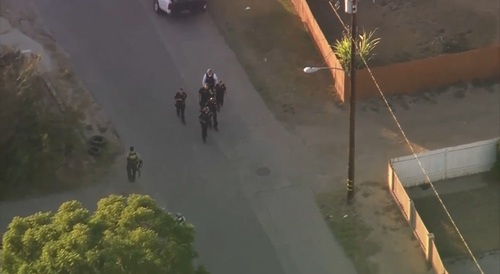 Police are expected to give some significant updates on the shooting suspects. 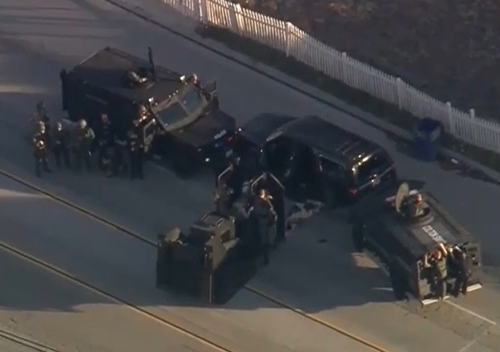 Armed police cars are now on the move. 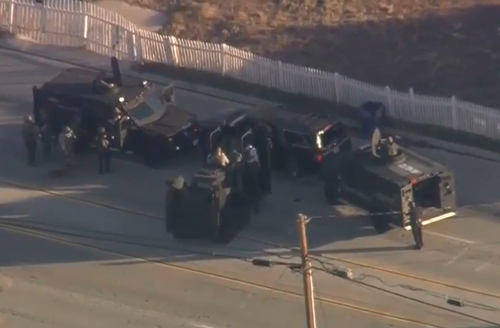 One suspect still at large after San Bernardino shooting, police say. "Everyone dropped to the floor. 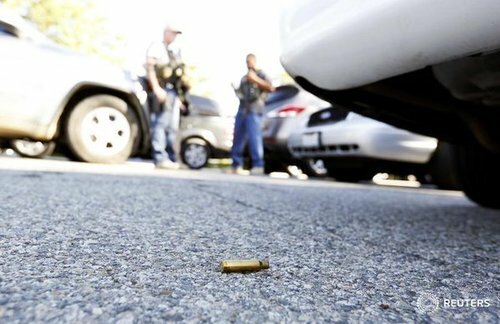 The guys opened fired for 30 seconds, randomly, then paused to reload and began firing again." 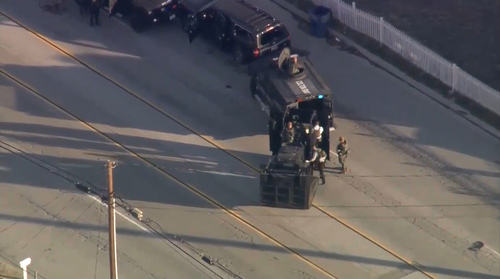 One victim, 27-year-old Denise Peraza, told relatives by phone that two men dressed all in black and wearing black face masks had entered the holiday party and started shooting, according to the Los Angeles Times. 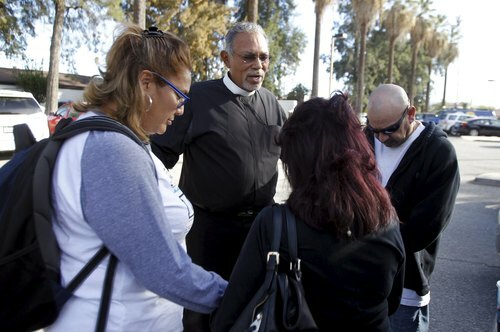 Peraza was hiding under a desk when she was shot once in the lower back, the newspaper said. 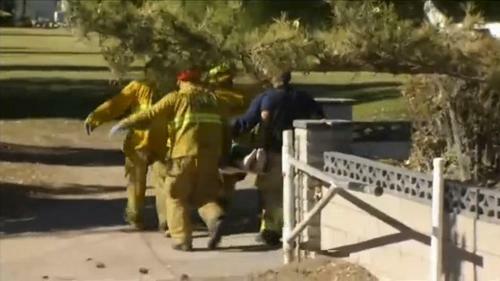 Police spokeswoman at press conference says situation is still active. 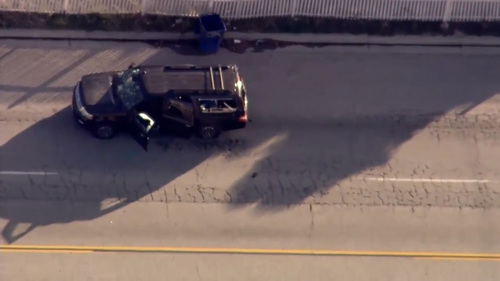 CNN reporting there could be one, even two, bodies inside this SUV. 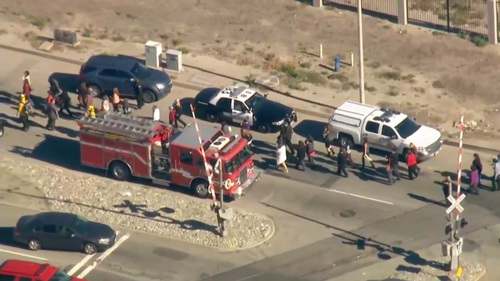 Police have their guns drawn and are spreading out on foot -- some getting back in cars. 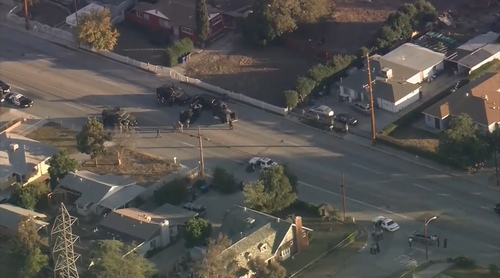 Lots of police activity surrounding area where one suspect has been shot and killed -- looks like a residential area with many homes nearby. 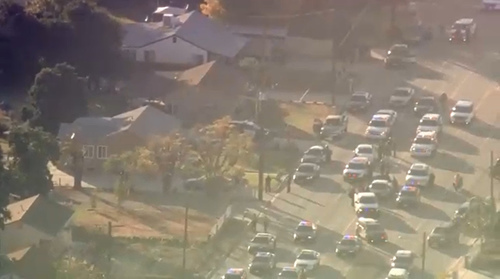 Police say they cannot confirm suspect is related to earlier mass shooting. 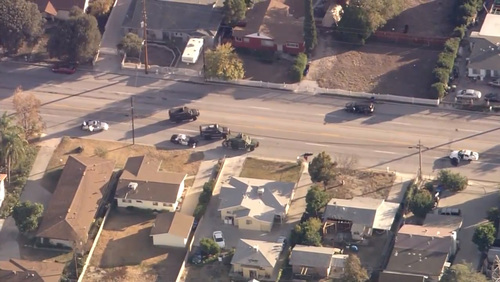 San Bernardino police spokeswoman says "there were shots fired. 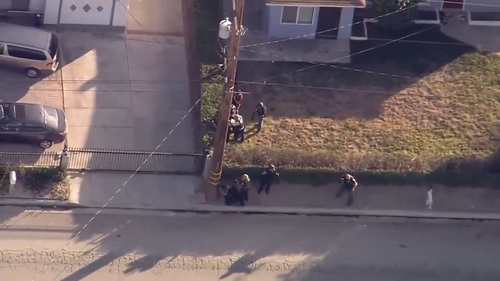 Officers were involved and there is a suspect down." 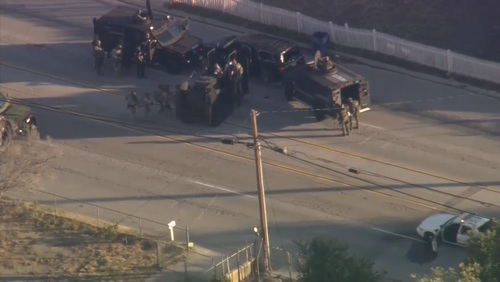 BREAKING: San Bernardino say one suspect "is down." 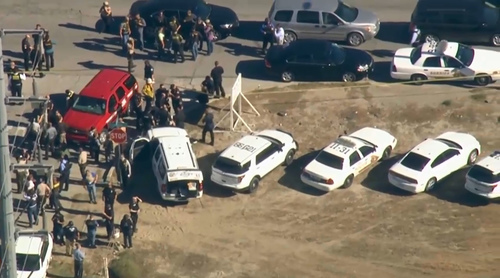 San Bernardino Police Chief Jarrod Burguan says preliminary numbers show that upwards of 14 people are dead and at least 14 people injured in a shooting at a social services agency. 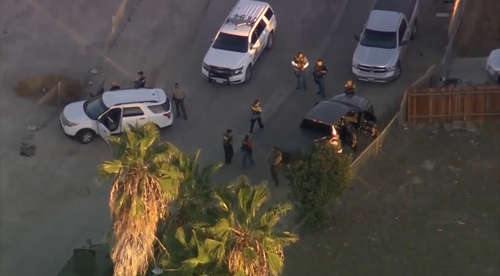 TV footage shows person on ground in San Bernardino next to dark vehicle with windows apparently shot out. 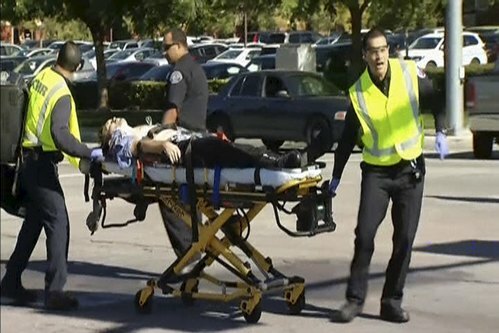 ReutersFourteen people were killed and 14 were wounded on Wednesday when at least one person opened fire at a social services agency in the Southern California city of San Bernardino, the latest of many deadly rampages in the United States.